Podiatry is the word used to describe the branch of medicine concerned with the lower limb, particularly the foot and ankle. Podiatrists diagnose, treat and prevent foot problems using chemical, physical, mechanical and surgical therapies. Our feet are probably the most neglected part of your body. Generally you take your feet for granted and it is not until problems occur that you may consider getting them checked. How often have you said to yourself “my feet are killing me”! Where as really you should be asking yourself “Am I killing my feet”? Don’t leave it too late. By looking after your feet now you will be able to live an active life doing the things you enjoy. 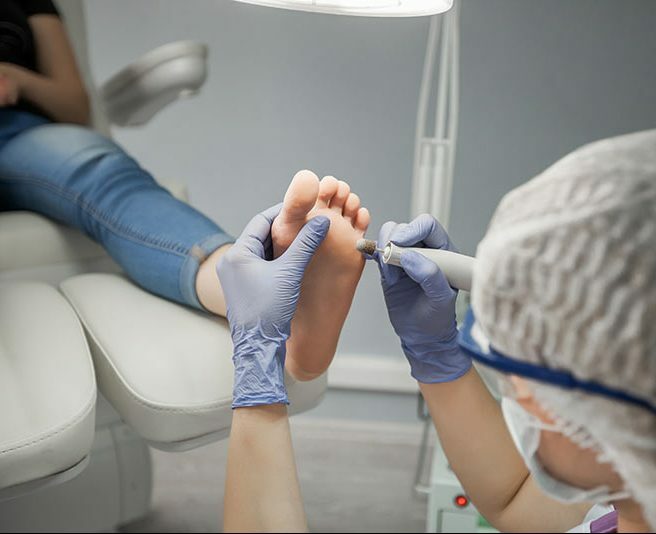 We cover a wide array of general foot maintenance, such as correctly cutting, filing and reducing the thickness of the toe nails, removing areas of hard skin and providing advice on suitable products related to the overall care of your feet. This is increasingly important as we age or suffer reduced mobility as routine foot care becomes very difficult to perform ourselves. Calluses are areas of thick yellowing skin on the feet which can make walking very painful. They typically occur on areas of the foot exposed to excessive pressure or friction – there can be a number of reasons for this but a typical situation would be poorly fitting shoes or the thinning of the fatty tissue under the ball of the foot. Corns often occur on weight bearing areas of the foot, or those areas experiencing high pressure. There are several types of corn under these different circumstances, some can be quite passive and cause little practical concern, whilst others can be extremely painful. Either way a corn is a symptom of a specific problem, something we can diagnose and treat appropriately. A very common issue, fungal nail infection affects around 3 in every 100 people in the UK. Toenails can appear yellowy brown in colour and begin to crumble when infected. Although it’s not particularly painful at first, over time as the nails thicken pain can occur as more pressure is placed upon the nail bed. Athletes foot is an infection caused by fungus which can appear in between the toes and on the feet. It can make the skin red, flaky and itchy and as the name suggests those playing regular sport are at particular risk. Whilst with treatment it can clear it up in a matter of days, if misdiagnosed the symptoms can persist for months if not years. Detailed assessment of underlying structure and function can help to identify factors that may be causing or contributing to discomfort. The use of special shoe inserts (orthoses) can help to control the way in which the foot and therefore legs function and thus reduce discomfort. However, attention to shoes and muscle strength/flexibility can all improve function. The name Chiropody was changed to Podiatry in 1993. Podiatry is the internationally recognised name for our profession. Podiatry is a constantly evolving profession, the extensive training given to students over the 3 or 4 years of their full time course and the continuing education after graduation ensures that podiatrists skills and knowledge are current. Biomechanics is the study and analysis of gait and human movement. Podiatrists observe patients for any alterations in the optimum sequence of events between the foot, the lower limb, and the rest of the body during the walking (running, cycling, skiing etc) phase. Deviations from the optimum, can lead to heel pain, foot strain, ankle, knee, hip, lower back and neck pain. A biomechanical assessment may indicate that you would benefit from wearing an orthotic. Orthotics are prescription insoles which stabilise the foot holding it in the ideal position. Repositioning the foot alters the angles at which the foot strikes the surface. Wearing orthotics can improve corns and calluses, ankle sprains and knee, hip and back pain. Do podiatrists treat sports injuries? Podiatrists treat sports injuries with various therapies; biomechanical assessment, orthotic prescription, muscle stretching exercises, strapping, advice for self-treatments. Where necessary, referrals are made to Physiotherapists, Osteopaths and Doctors. Most commonly children require podiatric treatment for gait problems, verruca and ingrown toenails. As a general rule of thumb our appointments for routine podiatry last around 30 minutes, but depending on your requirements or if you’re booking in for more detailed services such as biomechanics, you may require up to an hour or more. Either way, we’ll let you know when you make an appointment. I have private medical insurance, are my appointments with you covered? You’ll find that we’re covered by most major insurance companies as all of our podiatrists are registered with the Health and Care Professions Council and we’re also actively on a number of their referral lists. Payment is made at the end of each treatment session either by cash, cheque or credit / debit card. Podiatry services are available at our Holborn Practice.